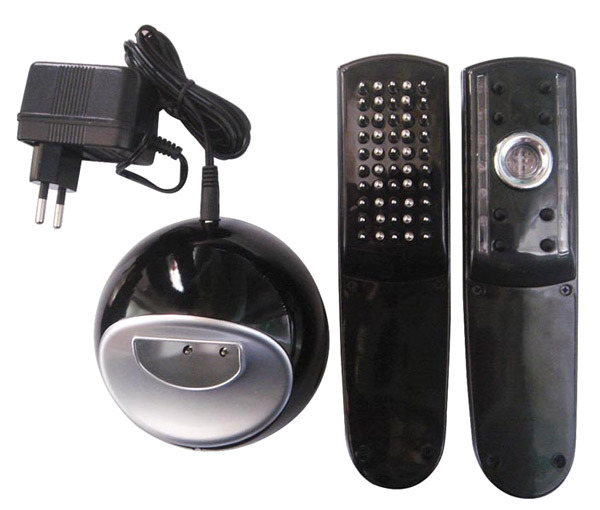 It is a combination of infrared, ozone and impulse technology and principles of traditional oriental medicine and massage techniques, to stimulate dormant hair follicles and promote healthy hair growth. Price: $189.95 USD with free 6 month supply of Minoxidil 5%. The price is $169.95 without minoxidil. 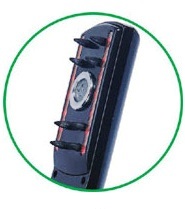 The FolliNex Hair Loss Comb massager has two components: the Electronic Comb Massager (Component A) and the Infusing-Style Comb Massager (Component B). Infrared technology has been proven to help increase capillary blood flow to the dermis. This technology increases cellular metabolism, blood circulation and oxygen supply to the dormant hair follicles which in turn results in the promotion of hair growth and prevention of hair loss and thinning hair. Male hair loss and female-pattern hair loss are progressive conditions. If we can stop or stabilize their progression at an early stage, it will be much easier then to combat thinning hair and hair loss. FolliNex low grade Infrared Light Hair Loss therapy acts on the hemoglobin in the blood to cause the release of nitric oxide. Nitric oxide dilates blood vessels to increase blood circulation and results in the delivery of oxygen to hair follicles. 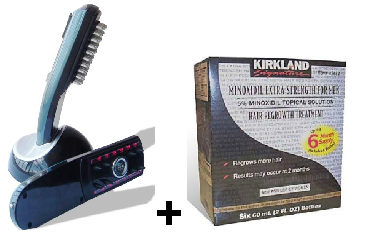 Simultaneously, the warmth generated by the Comb massager helps to enhance the end results. It raises the white blood cell counts, improves cell growth and protein synthesis in cells. It promotes blood circulation in cases of chronic rheumatism; and generally eliminates pain, fatigue, stress and relief from all forms of arthritis. It is used in hyperthermic therapies for detoxification. It is also used to treat sport injuries; musculoskletal injuries, such as repetitive strain injuries. It is used to treat hypertension, arteriosclerosis and coronary artery disease by dilating blood vessels and tiny capillaries. Infrared ray stimulate your metabolism, promoting the elimination of nasty toxins that accumulates in cells such as carcinogenic heavy metals, toxic substances from food processing, lactic acid, free fatty acids, and uric acids. Ozone therapy is a widely used therapy in countries such as Germany, Canada, Italy, Switzerland, Russia, Cuba and many Eastern Europe countries. Ozone therapy helps to stimulate the follicles, creates a germicidal environment, improves conditions such as hair loss and dandruff, promotes hair growth and restores health to the hair follicles and scalp by invigorating the scalp with oxygen, killing bacteria and fungii. For references, see, inter alia, MATTASSI R., Ozonoterapia, Milano, 1985; Boccl V., Autohaemotherapy after Treatment of Blood with Ozone. A Reappraisal, in Journal of International Medical Research, 1994, vol. 22 (3), p. 131; VIEBAHN R., The Use of Ozone in Medicine, Heidelberg, 1994; MADEJ P. - ANTOSZEWSKI Z. - MADEJ J.A., Ozonotherapy, in Materia Medica Polona, 1995, Vol. 27 (2), p. 53; Boccl V., Ozone as a Bioregulator. Pharmacology and Toxicology of Ozonetherapy Today, in Journal of Biological Regulators and Homeostatic Agents, 1996, Vol. 10 (2-3), p. 31. Massage Therapy, the use of massage on the scalp has been well documented in traditional oriental medicine, to increase blood circulation and deliver sufficient nutrients to hair follicles to prevent hair loss and thinning hair. The FolliNex Massage Comb, has uniquely combined both a massager and an infusing function into one easy to use follicle massager. 2 rows of specially made stainless steel beads embedded in the massager evenly distribute essential ingredients from any hair loss growth lotion or serum (not included). 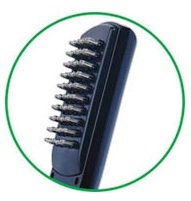 Through gentle vibration massage, the comb helps the scalp achieve maximum results from the hair loss treatment serum or lotion while increasing blood flow to the affected area simultaneously. With the combination of gentle massage and even distribution of essential nutrition from hair loss serum, the comb helps to stimulate hair follicles and improve the healthy hair environment which are essential to hair loss prevention and hair re-growth.